The leader of US group Nation of Islam, Louis Farrakhan, addressed US foreign policy and religious unity in a speech billed as his final public address. The 73-year-old leader of the black Muslim group spoke to thousands of supporters at a stadium in Detroit. In a two-hour speech, he said US President George W Bush should be impeached over the war in Iraq. The charismatic but controversial Afro-American leader has been in poor health in recent months. In September last year he relinquished control of the organisation, telling members he was seriously ill. In January he underwent surgery for an undisclosed condition. Supporters see Mr Farrakhan as a role model for black empowerment. But critics accuse him of anti-Semitism - he once called Judaism a "gutter religion" - and inciting racial tensions. He has been banned from entering the UK. 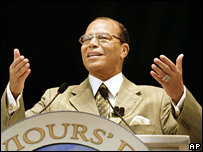 Speaking at an annual meeting of the Nation of Islam, Mr Farrakhan said that the US invaded Iraq because Saddam Hussein became an economic threat. "What should they do about a man who has been lying to America?" he said of Mr Bush. "If you won't impeach him, sanction him." He also said that America had no right to deny Iran nuclear power, and urged young people not to join the military. "I'm here to tell you, brothers and sisters, that's the worst decision you can ever make." He said the world was at war because of divisions between people of different faiths. But despite speculation, he did not use the speech to name a successor.